Dédale - Site de jordan-deschamps ! Inspired by the experience of male saunas, Dédale is a celebration of the male body, a contemplative opportunity for an audience to witness gentle relations between men. 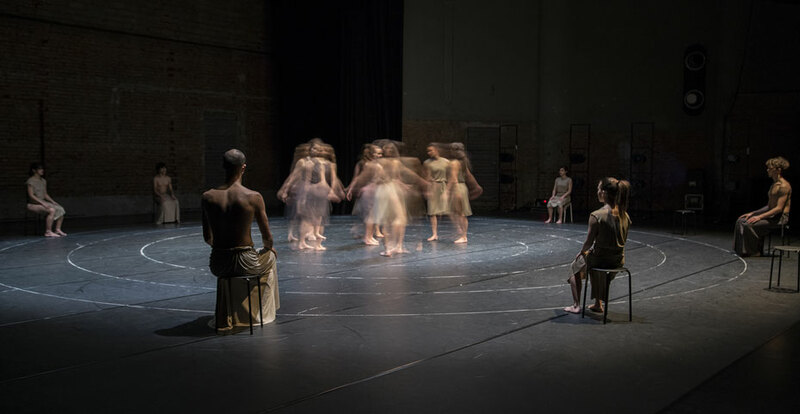 Smooth, undulating and interlacing bodies slowly move on stage, quoting some master pieces of the Art History. A deeply meditative and poetic experience, Dédale and its four performers will take you to unexpected territories. Imagine that you are climbing up a hill, on a summer night, lying on the grass and looking up to the sky, and let yourself forget about time... The piece is a choreographic meeting between astronomy and astrology in order to establish a night sky contemplation. The 12 dancers impersonate each of the signs of the zodiac and move in space respecting some astronomical rules. It results in a very visual, mesmerizing, intriguing, circular and hypnotic dance piece where you actually get the chance to loose any notion of time. Premiere: 10/02/2016 in Republik Theatre, Salzburg-Autriche, “New Faces New Dances festival”. Daedalus is the first version of "Dédale". Created 2 years before and with 6 dancers, its format is short (10 min). For more informations regarding the piece description, please see "Dédale" one. Music: "Casta Diva" Bellini sang par Maria Callas. "Night/Day" is a piece based on a childhood memory and inspired by the Japanese manga cartoon "Cat's Eyes". It is a very fresh and visual piece where the audience can refer to comic elements as the bubbles drawn on the floor and their use, popular images and clichés, Asian references, as well as pure contemporary dance skills. The piece plays with moods, energies, feelings and surprises. The humor sense is extremely present and will bring you years ago back to your childhood when you enjoyed the biggest simplicity to be entertained. Music: "Flower Duet" Lakme, Leo Delibes - Cat's Eyes Japanese Credits - "Night/Day" original creation by Alexandre Eber-Kauffmann.